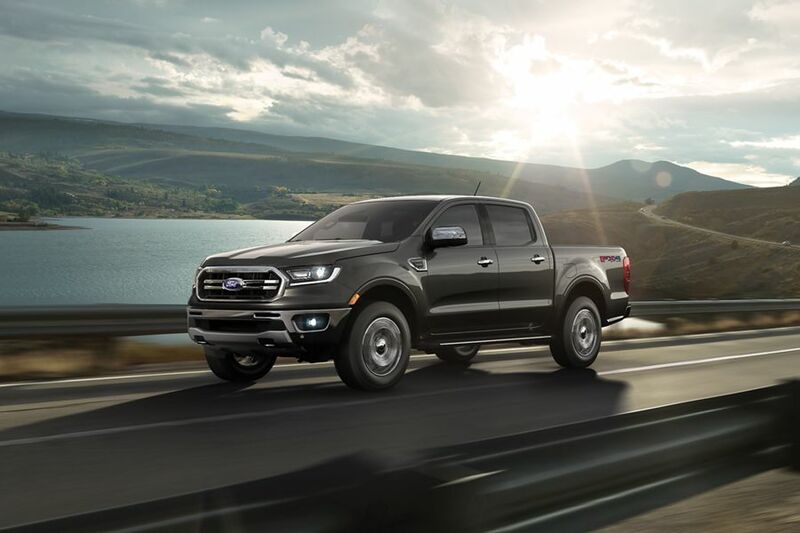 With the 4×2 configuration, the 2019 Ranger gets an estimated fuel economy of 21 city/26 highway/23 combined mpg. With the 4×4 configuration, the 2019 Ranger gets an estimated fuel economy of 20 city/24 highway/22 combined mpg. These are the best efficiency ratings of any gasoline-powered midsize pickup truck in the United States. Payload and Tow Capacity of the 2019 Ford Ranger? While having blind spot warnings can be useful, if you are towing you may also want warnings about when a vehicles is next to your trailer. Fortunately BLIS on the 2019 Ford Ranger includes trailer coverage. Drivers can keep up to three trailer profiles in the Ranger’s system so that the radar knows the length of the trailer and how far back to provide warnings. It can be challenging to haul a trailer, but with the Blind Spot Information System on the 2019 Ford Ranger drivers can leave some worry behind. You can see this in action on the video embedded in this page. In addition to BLIS (which will also work just fine without a trailer) the 2019 Ford Ranger is available with rear cross traffic alerts that will warn drivers if there is a car coming behind them when they are leaving a parking space. This can make leaving a parking lot or a tricky work site even easier. The Ford F-150 employs a few modest updates for 2019 to stay relevant in the face of completely redesigned competitors. Join me in reviewing my time behind the wheel of Ford’s 2017 Escape SE!!! First impressions: The 2017 Escape has a sporty and rugged appearance. It maintains the sleek body lines shared by previous model years, but has a more aggressive reconfigured nose and front end. 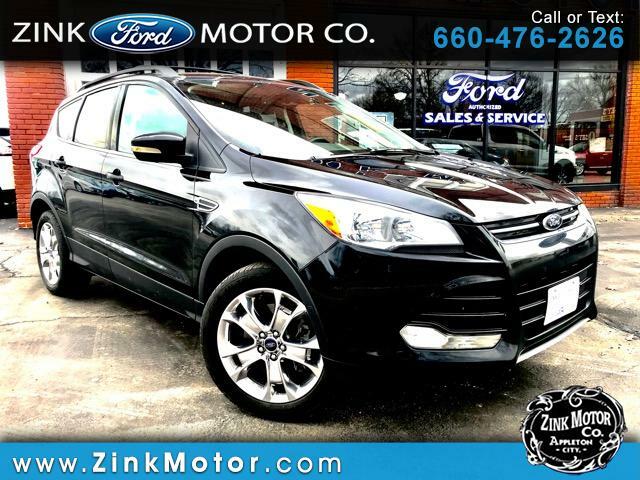 Ride, Drive & Comfort: The Escape has a nice, smooth ride. I found the steering and suspension to be very responsive. It handled corners and transitions with ease. I noticed little road and wind noise. A definite improvement from previous model years. Like other 2017 Ford vehicles the cloth interior has a more rugged feel to it and seems much less prone to staining. The seats are comfortable and supportive. I found the seating position to be very driver friendly. It provided nice front and side visibility. The controls as well were all in easy reach for both driver and passenger. Ford SYNC system works very well and is leaps and bounds above previous versions. It paired seamlessly with my phone and automatically connected each time I entered the vehicle. The rear seats fold down allowing for additional storage. I also found that rear passenger leg room to be very reasonable for small vehicle. Something else that I found convenient was the Escape's tight turning radius. It made backing and maneuvering in tight parking lots easy. Engine performance: This Escape was equipped with Ford's 1.5L engine. It is a very good match for the FWD Escape. It is peppy and low speeds and pulling out into traffic and can still achieve 30 MPY Hwy, which is nice. Overall, I really enjoyed my time behind the wheel of the Ford Escape. It's practical, looks good, nice MPG and reasonably priced. Which makes it a winner in my book. Join me in reviewing my time behind the wheel of a 2015 Ford F-150 XLT FX4! First impressions: There is a reason the iconic Ford F-150 has been the number one selling truck for 41 years straight. It is beautifully designed, powerful and fictional. Perfect for the family or job site, with a wide array of available options to suit any buyer. Ride, Drive & Comfort: I have driven every body style Ford truck from 1957 - today and I have enjoyed each one for different reasons. 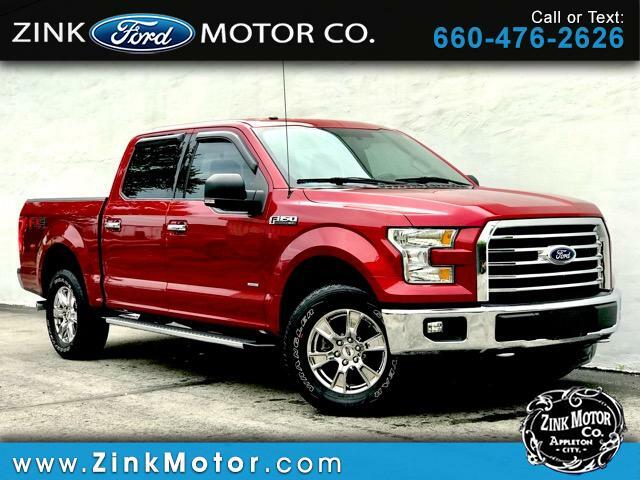 The latest line of F-150's from Ford are truly awesome trucks. The truck was a joy to drive . The ride was really smooth and comfortable. The cabin is extremely roomy. Rear passengers have an abundance of leg room and the rear seat folds up clearing space for quite a bit of storage inside cab. I found front, side and rear visibility to be extremely good. No noticeable blind spots. Like all other Ford products, this truck had the optional back up camera. Which aided driver confidence when backing in crowded parking lots. Combined with the trailer tow package the back up camera also made hooking up a trailer easy. Driver controls are all within easy reach and easy to commit to memory. The radio had a great sound. A feature I particularly enjoyed when I was riding by myself was the ability to change the sound settings to driver only. It made it feel like the drivers seat had its own personal surround sound system! Engine performance: At 282 HP and 253 lb-ft of torque Ford’s 3.5 V6 is a very good match for this truck. It had ample power for quick acceleration and passing. The engine did what it was supposed to, when it was supposed to do it at a level that met / exceeded my expectations. I took this truck on a trip to West Virginia to pick up a Ford Model T. On the way to West Virginia pulling an empty trailer we averaged 18.3 MPG. On the way home with car loaded we averaged 16.2 MPG. A side note after we were back home and had unhooked the trailer the truck averaged 23.1 MPG HWY. I was pleasantly surprised how power the 3.5L ecoboost engine was. Even when climbing hills towing the Model T in the Appalachians we could hardly tell the trailer was there. Can't say enough how enjoyable this test drive was! Overall I enjoyed my time behind the wheel of the Ford F-150. It is a sharp looking, versatile and practical vehicle. With great power, smooth ride & great tow / haul capacity. Join me in reviewing my time behind the wheel of Ford’s 2013 Escape SEL!!! First impressions: I have liked the sleek lines of the 2012-2016 Ford Escape since I first laid eyes one in 2012. The Escape I test drove was particularly sharp looking with 18" polished aluminum wheels and tuxedo black metallic paint. The interior is equally well designed with numerous comfort and convenience options at my finger tips. Ride, Drive & Comfort: The vehicle had nice, smooth ride. In regards to cabin noise the Escape falls somewhere in the middle. It isn't as quiet as an Explorer but is quieter than a Focus. I found the Escape to be very nimble and responsive. It navigated congested traffic with ease. Rear and side view mirrors all provided good visibility. I found no issues with blind spots while passing or backing. I really liked the configuration of the controls on the steering wheel. I actually prefer this configuration over new version. The placement of the cruise as well as radio controls are convenient and easy to commit to memory. I also liked the dial indicator controls for the heated seats. The heat dial can be set anywhere from 0-5. With that wide of a range, it is easy to find a temp to fit your and your passenger. The power adjustable seats were very comfortable and paired with a telescoping steering wheel means the Escape can fit drivers of varying shapes and sizes comfortably. During summer or winter months the remote start feature is very nice. Being winter now, I used this feature daily. Engine performance: The 2.0 engine is a good match for the Escape. It had ample, smooth power for passing or quick acceleration. The only I was disappointed in was fuel economy. I anticipated the Escape to average 26-27 MPG instead of 23. Overall, I really enjoyed my time behind the wheel of the Ford Escape. The Escape is a nice looking, versatile and practical vehicle. With ample power and a smooth ride. In browsing our used inventory you might notice that many of our vehicles have both a Retail Price and an Internet Price. We provide those two figures for a very specific reason. Whether you purchase your next vehicle from us or not. We know your time is valuable and we want to do everything possible to help make your purchase decision easier and more convenient. Our Retail Price is the Kelly Blue Book Fair Purchase Price. That is the price Kelly Blue Book says other buyers have recently paid for that same vehicle. Our Internet Price is the price we are willing to sell that vehicle for. There are a lot of vehicle valuation tools out there that provide a wide range of values for the same vehicle. Some of them we felt provide inflated vehicle valuations. Which would have made the green Savings box below our Internet Price look good, but it wouldn't provide our customers with information of any real value. We chose to provide customers with the Kelly Blue Book Price because it is a widely used and respected price tool that many of our customers are already familiar with. That is one of the two valuation tools available at Zink Motor Co. Within each vehicle detail page, positioned below vehicle photos on ZinkMotor.com is CarStory. 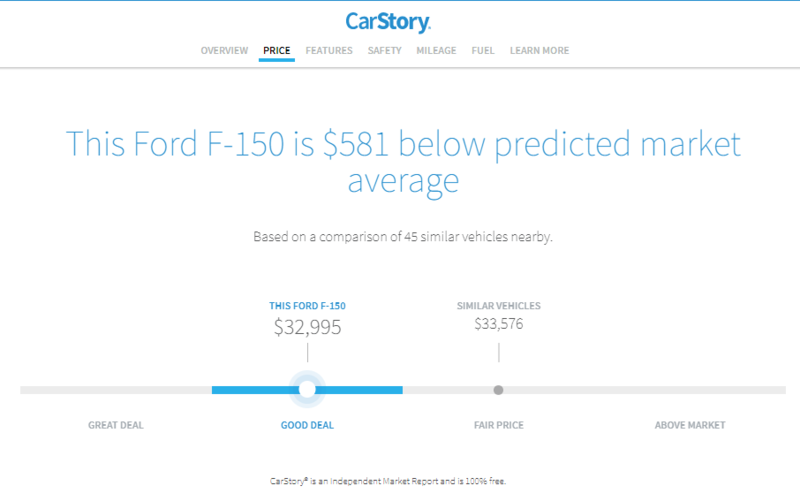 CarStory is a unique tool that provides customers with vehicle overview, price analysis, vehicle features, safety ratings, mileage and fuel economy. The best part of this tool is it's independent. We have no control over information and stats Carstory provides and we wouldn't have it any other way. 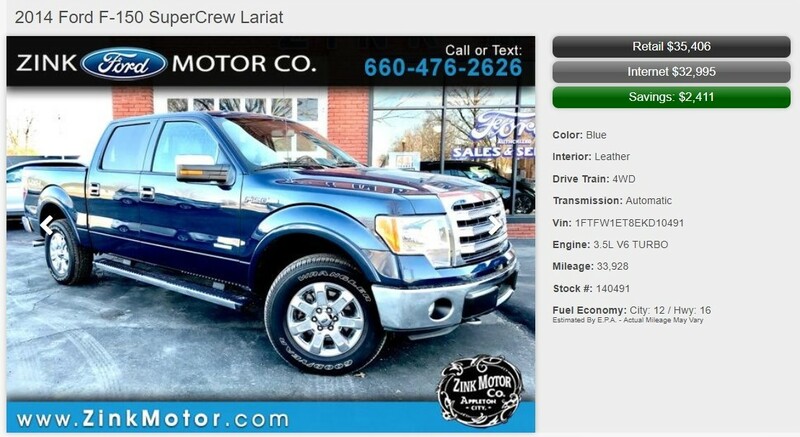 CarStory is just one more way we are able to bring vehicle information to our customers. Join me in reviewing my time behind the wheel of Ford’s 2017 Explorer Limited!!! First impressions: When Ford starting building the Explorer on its current unibody platform in 2011. Part of me was sad because with that change a piece of its rugged, off-road heritage died. But let’s be realistic. Explorers aren’t purchased to drive off road in extreme conditions. They are purchased to transport people from A to B on smooth, maintained roadways. Switching to a unibody FWD platform allowed Ford to provide customers with a vehicle much better suited to modern driving conditions. I think the Explorer looks great and its features are well designed and thought out. Ride, Drive & Comfort: The vehicle had a smooth ride. It handled rough roads and transitions with ease. We had an ice storm two days ago. The Explorer performed great on the icy roads. The all-wheel drive and braking system worked superbly. It worked so well in fact that if one wasn’t careful, he / she could end up over confident in their abilities. Or underestimate the severity of road conditions. Which, you can’t really fault Ford for building an AWD drive and braking system that works so well that slick roads become easily navigable. The Explorer I drove was a Limited and equipped with almost every option available. I have driven base model Explorers before, while they were perfectly adequate. If your preference and budget allow, the convenience and comfort upgrades are well worth it! Heated and cooled seats, heated steering wheel, remote start, HID headlights are a few items that don’t require further explanation that I thoroughly enjoyed. A couple features that I do want to go into more detail on is Ford SYNC 3 and power folding rear seats. I personally own a vehicle with first gen Ford SYNC. At the time it was nice to be able to use the phone hands free or play music from our phone through the car stereo. But we found it to be a bit glitchy, and as a result we don’t often use it. I found SYNC 3 to be a completely different experience. All I had to do was plug my phone into the USB port and it instantly identified it and showed my apps that were SYNC compatible. From there all I had to do was select play and I was listening to music. No switching menus or having to talk to the car, only to have it not understand what I said. It was a seamless, very pleasant experience. Next onto the power folding third row seats. This feature has been around for some time. It used to be if your Ford had power folding seats. You had to push the button and hold it in until the seats reached the folded position (which for the most part was still better than doing it manually). Those days are gone! Now all you have to do is tap the button and the power folding seats take it from there. So, when you’re approaching your Explorer, arms full of groceries. You can open the power liftgate (hands free) and simply tap the fold seats button with one finger, knuckle, elbow or whatever appendage you have available. The seat/seats fold themselves. Moving onto visibility, I found forward and side visibility to be very good. When looking over my shoulder while backing. I did find the second-row headrest blocked visibility out of the side cargo area windows. Like many other Ford vehicles this Explorer had a large display for the back-up camera which provided a way to view blind spots created by the headrest. Engine performance: This is the second Ford Suv / Crossover I have reviewed with the 3.5 V6. Just like my previous review of the Ford Edge. There isn’t much to say. At 290 HP and 255 lb-ft of torque Ford’s 3.5 V6 is a very good match for this vehicle. It had ample power for quick acceleration and passing. The engine did what it was supposed to, when I was supposed to do it at a level that met my expectations. Overall, I really enjoyed my time behind the wheel of the Ford Explorer. I am actually sad to see this test drive come to an end. 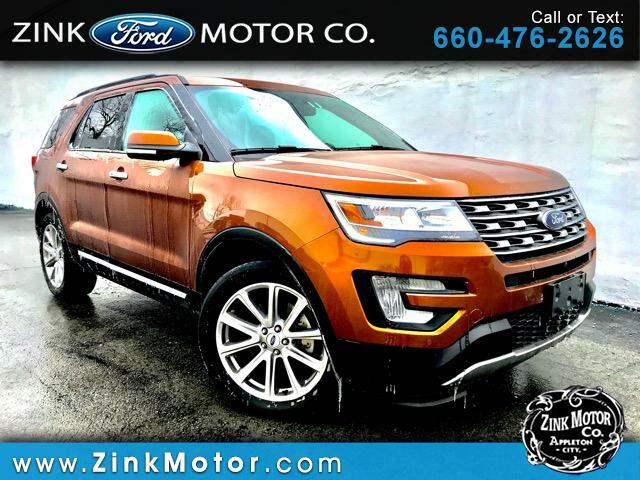 The Explorer is a sharp looking, versatile and practical vehicle. With great power, smooth ride & ample storage. Join me in reviewing my time behind the wheel of a 2015 Ford Edge!! 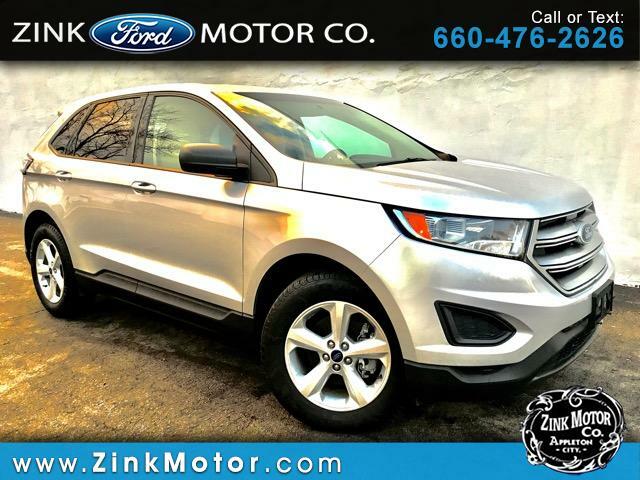 First impressions: I have always thought the Ford Edge was a good looking vehicle. While I am not in complete agreement with the direction Ford is heading with nose and grille design. Overall the Edge has great lines and nice stance. 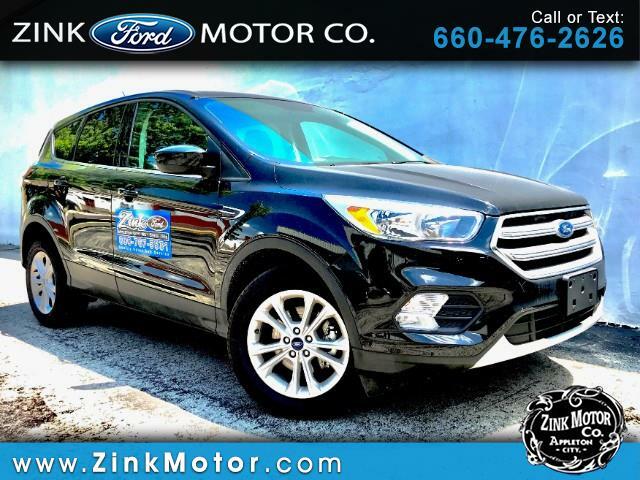 Ride, Drive & Comfort: Ford did an excellent job with this vehicle. The cabin is very quiet. The steering responsive, with minimum body roll. Somehow Ford has managed to give the Edge a ride that is both firm and plush. Considering it is a crossover, the vehicle handles quite well. On tight, curvy roads the suspension feels firm and responsive. Yet on rough terrain it absorbs bumps and transitions with minimal disturbance to passenger comfort. (Well done Ford). The height of the vehicle combined with seat position provided very nice forward visibility. I was high enough to see over and around cars with ease, but not so high that the vehicle felt top heavy. I have already stated front visibility is excellent. However, I found visibility from the B pillar back to be a bit restricted. The C pillar combined with size and shape of adjoining windows created a blind spot on both sides. This was noticeable when backing out in crowded parking lots. This Edge did have a backup camera which helped with blind spots. (As I have mentioned in a previous review I am part of the general population who prefers line of sight vision over cameras). The seats are supportive and comfortable. This particular Edge has cloth seats. A decade ago I would have told anyone who ask to steer clear of cloth. It didn’t wear well and stained easily. However, driving this Edge has made me a believer that Ford has made massive strides in the quality of their upholstery. The Edge I drove had 85,000 miles on it and the upholstery looked brand new. The seats showed no wear and there was zero staining. The upholstery had a very durable feel to it and the foam showed no sign of breaking down. The radio had a nice balanced sound and Ford SYNC paired seamlessly to my phone. Steering wheel mounted controls allowed me to keep both hands on the wheel while changing stations and adjusting volume level. Engine performance: There isn’t much to say. At 285 HP and 253 lb-ft of torque Ford’s 3.5 V6 is a very good match for this vehicle. It had ample power for quick acceleration and passing. The engine did what it was supposed to, when it was supposed to do it at a level that met / exceeded my expectations. Overall I enjoyed my time behind the wheel of the Ford Edge. It is a sharp looking, versatile and practical vehicle. With great power, smooth ride & ample storage.